North on CO 135 (Main St) for 1.3 miles. Watch for Cranor Hill Ski Area sign. Turn right (east) on road after sign. Immediately turn left and travel north for .3 miles. AmeriGas is on the left. County Road 10 is on the right. Turn right on CR 10. Follow CR 10 for 1.9 miles. CR 10 will begin to curve to the right. 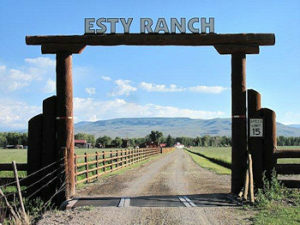 The entrance to Esty Ranch is on the left. East on US 50 (Tomichi Ave) for 8 miles. East on US 50 (Tomichi Ave) for 7.5 miles. Turn right on CO 114. Follow CO 114 south for 1.7 miles. Copyright © 2019 by Esty Ranch, LLC. All Rights Reserved.